Hoot Hoot, who loves owls? Me that's who and so do the kids, they'll get a kick outta these owls and their tree habitats. Use this project to teach sounds, warm colors or letters. Glue the owl into the knot of the tree or leave him loose so kids can take them out and play with them. Step 1. Have the kids punch out little circles in various colors for the eyes and belly feathers. Cut a 12"x4" piece of brown paper for the tree trunk, fold in half and cut a hole in the center. Cut a piece of 6"x4 1/4" piece of paper to cover your tube in. Cut strips of brown paper, and pieces of tissue paper. Step 2. Assemble your owl by wrapping the tube in the paper and stapling it on. Fold and bend down the top of the tube to create the ears and glue on an upside down heart for a face. Embellish your owl with feathers and the little paper circles. Don't forget the beak. Step 3. 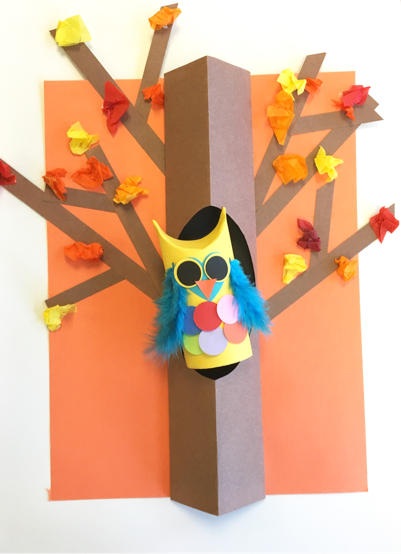 Glue a strip of black paper to the middle of your background and then the tree on top, add branches and leaves to the tree, and lastly the owl. Draw on any additional details.